Find the Different Picture or Can you find the different? are some types of puzzles in which we have to find the different picture out among the set of similar pictures. These are called Odd One Out puzzles. These puzzles are not limited to Picture Puzzles, but Odd One Out type of puzzles includes doing the mathematical calculations to find different number out among given set of numbers. It could also be finding the different letter among the given set of letters. There are wide variety of puzzles which can be included in Odd One Out type of puzzles. There are many different Odd One Out puzzles on this website and this page list the link to all the different Odd One Out puzzles on this website. 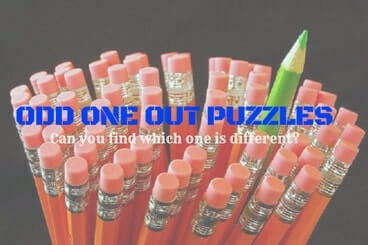 Do click on the links given below to open the corresponding Odd One Out Puzzle.